Author 3rdCultureChildrenPosted on April 8, 2011 October 7, 2012 Categories photography, SOUTH AFRICA, TRAVEL, wildlifeTags travel theme, wheresmybackpack17 Comments on Baie Dankie (“thank you”! ), South Africa – Animals and Memories. Living overseas brings you countless opportunities. Today, my family enjoyed a wonderful morning with other diplomatic and expat families. Helping is fun and rewarding. My husband was one of the 36 guest players. The tournament included representatives from the US Consulate, French Consulate and from the host Japanese mission… All players were asked to provide an “entry fee” for the tournament, which would be transferred to the Japanese Red Cross. The participants were greeted with a great luncheon provided by the Japanese Consulate and we all enjoyed a great performance offered by the musical group Ren Taiko, which means “Lotus Opium“. Event: Fundraising Golf Tournament, coördinated by the expat community in Recife, PE. Including representatives from the Consulates in town, expatriate families, businessmen. Pictures to come soon! In the meantime, I’d like to show my gratitude to the Consulate of Japan in Recife, for allowing us to enjoy a very nice Sunday, surrounded by friends. Will there be life after ‘Carnaval’? the popular choice: bright colors & lots of fun! We’re another foreign service family, posted in Recife, Pernambuco, Brazil, a place showcasing a magical mix between the Dutch, Portuguese, Spanish and native Indian cultures. Attractive for its scenery with ocean islands, rivers and bridges, we’re in the middle of a cultural diversity, a place full of history and captivating for its touristic attractions. Somehow, this month I found myself (a working-around-the-clock mom of 3 kids under 6 years old) with enough energy to go out, buy party costumes for the kids’ school carnival festivities, and search for a cute clown outfit for my 3 month old baby. All happening during my scavenge hunts along the neighborhood streets! March has arrived, and we’ve lively experienced the largest street carnival our five pair of eyes have ever witnessed: the so-called Galo da Madrugada (“Rooster of the Dawn”) and the exuberant colors on the streets of Olinda! 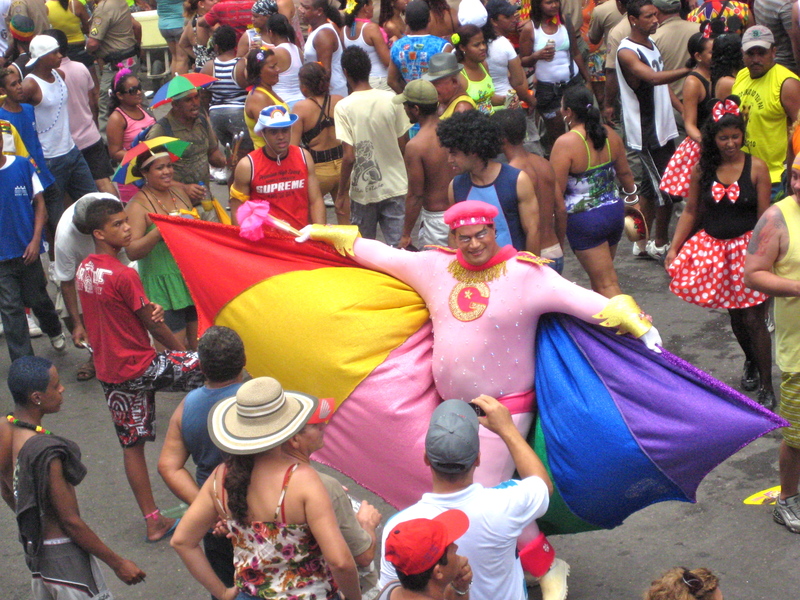 This massive parade – The Galo – happens every carnival Saturday, in downtown Recife, capital of Pernambuco. Its creator’s, Mr Enéias Freire came up with the original idea for a street party around the late 70s; and since then, it has never stopped, nor decreased in size! The Guinness Book of World Records assigns the Galo da Madrugada as the biggest carnival parade in the world, considering the number of participants. This year (2011), my husband and I were invited to watch the official opening (Friday evening), with governmental authorities, as well as the popular parade (Saturday) from the Mayor’s Official Box (“camarote”). At the “camarote”, besides watching the magnificent parade, it was possible to get your make up professionally done, or, if wanted, a relaxing massage while waiting for the brunch buffet! Observing my American husband’s reactions to the spectacle, it seemed like he’d been blown away by the magnitude of the event, the sheer number of people, the music, the dancing, the party atmosphere… It was simply wonderful just standing up there and looking over the whole thing: the look on people’s painted faces, their smiles, their tears of joy and pride. Indescribable beauty – the number of participants is said to have been over 1,600,000 people! one of Brazil’s all-time singers, Fafá de Belém, honoring the official ceremony on Friday; special guest for the Galo da Madrugada parade. Yes! Here, you can definitely find and buy anything on the streets; the world is for sale: lots of little “bancas” (street shops) sell everything imaginable, from hula skirts to cowboy hats. 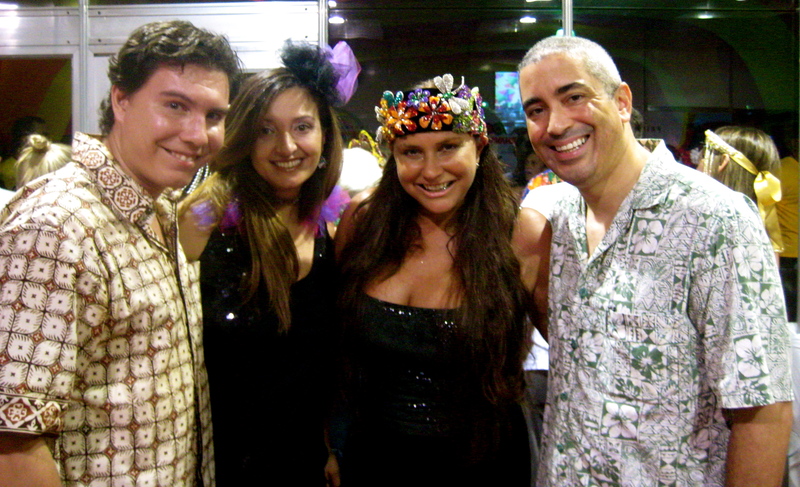 From pirate family costumes to Samba Schools full gear. Outfits and suggestions for a 9-week-old baby, to bright appliqué dresses to a ninety year old! You name it, and, if not found right on the spot, believe me, somebody would surely recommend a professional who could tailor it down for you – all before the very first scream from the “Rooster of the Dawn” street parade! Vampires, fairies, columbines, members of the “The Justice League”, kids’ cartoons’ characters, former and current “Country presidents” and “government representatives”… all in one place. Every single possible costume could be found among the party goers. Under one nation – the Brazilian Popular Street Carnival, partying rules are always respected, and everyone enjoys the festivities in peace. Joy surrounds the neighborhoods. Colors are mixed with the majestic sounds of the African atabaques, the bangôs, guitars, drums, tubas. Cold beverages are sold throughout the path, specifically designed and isolated for the street party. Celebrities from Brazilian television and from the big screen are also present, blowing kisses, to a delirious crowd of frenetic fans.Painted faces, bright from the dripping sweat, reflect the sun light. The heat does not prevent the people from dancing while following one of the 26 different fully decorated floats on the streets of Recife – this is the first and only “Galo da Madrugada”, a genuine representation of democracy, popular choice and why not say, the pure desire to just be happy, for 4 straight days..
Festivities here start around December, just after Christmas and New Year’s Eve celebrations – as locals begin preparing for the official Carnival, which starts a week (or two, depending where you’re living) before Ash Wednesday. The pre-Carnaval parties usually consist of percussion groups practicing in local clubs, city streets and squares, and even Carnival ball masques. People begin working on the “giant dolls” who will be displayed and gain life during the main parade. 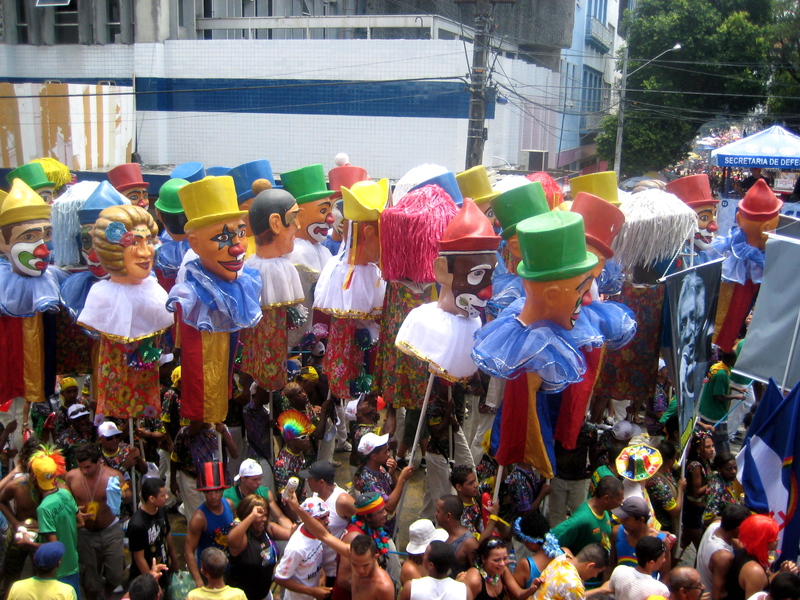 The “giant dolls” walk, move their bodies and dance to the contagious sounds of frevo. There are various rhythms: from native Indian and African Maracatu beats to Frevo and Samba. Carnival officially starts with the Galo da Madrugada, with endless parties in downtown Recife, attracting altogether as many as a million praters and observers, life myself. There is a queen and there’s a king for Carnaval. They’re both elected by popular choice, during the several “balls”, which precede the Carnaval week. And, to “their countrymen’s honor and glory”, the “royal pair” makes its unique appearance during the main parade. Their exclusive float brings glamour and pride to their “loyal people”, and, why not say, to every other plebe representative, which is watching, mesmerized and enchanted. And, talk about Olinda, with its spectacular scene! 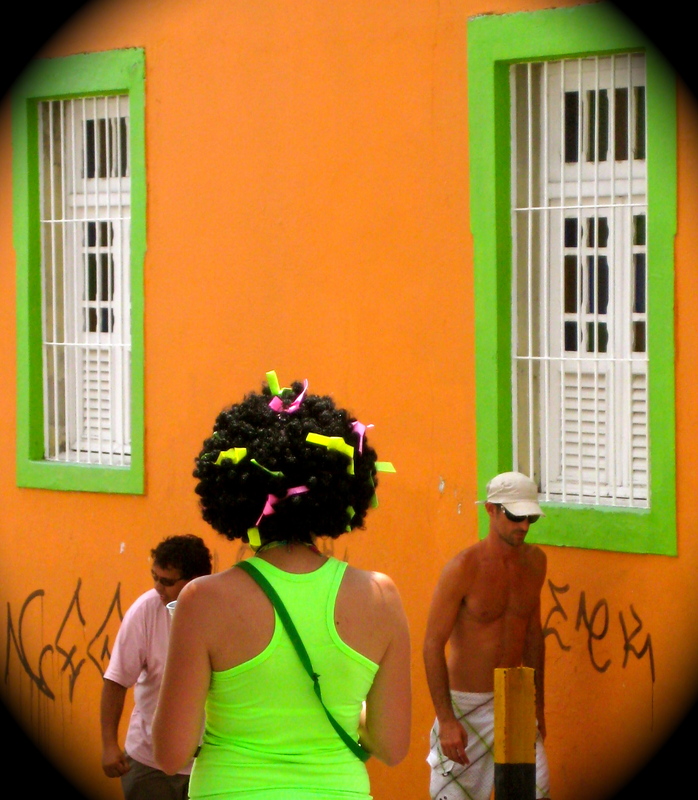 Olinda (neighboring city, 15 minutes from Recife) is responsible for many of the pre-Carnaval festivities. Some, actually starting as early as the second week of January! They’re called prévias because they precede Carnival. Extremely vibrant and festive events, offering a sense of the real thing. My family was able to enjoy an array of shows and parades, with many of the city’s best Carnival groups, before and after the “official Carnaval”! Hummm… Ash Wednesday arrived. Officially, Carnaval is over, right? Not here! People just can’t stop partying, and dancing, and singing… Life is more colorful during Carnaval. Life has a different meaning, during Carnaval. For many, the obligation to head back to work and/or school on Wednesday brought a bitter taste to their mouths…. “Is there any way to skip reality and dive back into the glorious sea of people that came to life during the 4 days of Carnaval?” or “How will we survive when all the Aftermath celebrations are finally over?” many ask… Yes, there’s still a trace of comfort for those who are having a hard time facing reality: the weekend has arrived, and with it, the gorgeous sun rays over the Atlantic ocean, right there, by the Avenida Boa Viagem… There’s still hope – let’s enjoy the weekend at the beach, and very patiently, await for next year’s celebration. I, for one, am already thinking about my costume for the 2012 Carnaval… What about you? Author 3rdCultureChildrenPosted on March 11, 2011 September 21, 2012 Categories BRASIL, CARNAVAL, expat, Fashion, Português, TRAVELTags Galo da Madrugada, Olinda, Recife43 Comments on Will there be life after ‘Carnaval’?